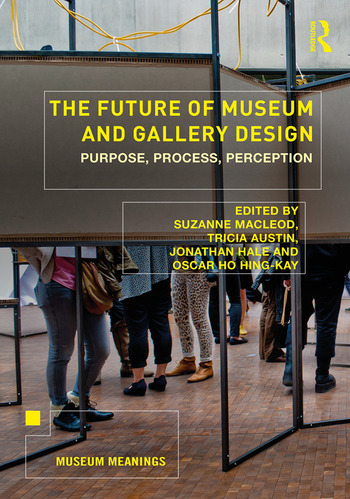 The Future of Museum and Gallery Design explores new research and practice in museum design. Placing a specific emphasis on social responsibility, in its broadest sense, the book emphasises the need for a greater understanding of the impact of museum design in the experiences of visitors, in the manifestation of the vision and values of museums and galleries, and in the shaping of civic spaces for culture in our shared social world. The chapters included in the book propose a number of innovative approaches to museum design and museum-design research. Collectively, contributors plead for more open and creative ways of making museums, and ask that museums recognize design as a resource to be harnessed towards a form of museum-making that is culturally located and makes a significant contribution to our personal, social, environmental, and economic sustainability. Such an approach demands new ways of conceptualizing museum and gallery design, new ways of acknowledging the potential of design, and new, experimental, and research-led approaches to the shaping of cultural institutions internationally. The Future of Museum and Gallery Design should be of great interest to academics and postgraduate students in the fields of museum studies, gallery studies, and heritage studies, as well as architecture and design, who are interested in understanding more about design as a resource in museums. It should also be of great interest to museum and design practitioners and museum leaders. Suzanne MacLeod is Professor of Museum Studies at the University of Leicester, UK. Tricia Austin is a design researcher and Course Leader at Central Saint Martins, University of the Arts, UK. Jonathan Hale is Professor in the Department of Architecture and Built Environment at the University of Nottingham, UK. Oscar Ho Hing-Kay is Associate Professor in the Department of Cultural and Religious Studies at the Chinese University of Hong Kong.